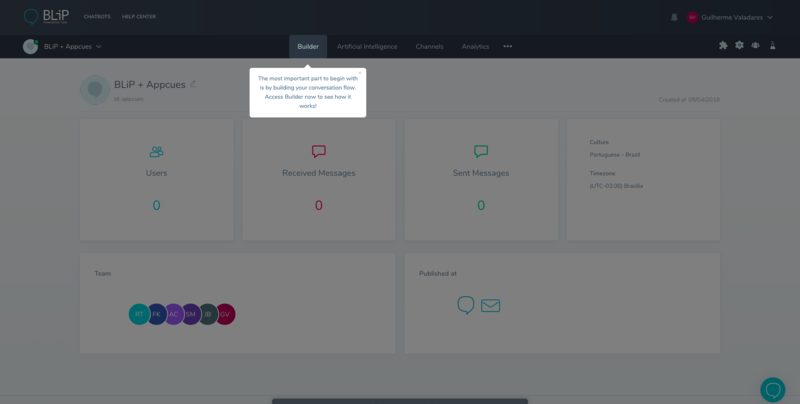 Take uses Appcues to optimize their onboarding funnel, draw attention to key features, and reduce the time it takes their users to find value in their chatbot builder platform, BLiP. Within two months of using Appcues, the team at Take saw a 124% increase in BLiP’s activation rate and a 9.7X reduction in time to value. We reached out to Guilherme Valadares, Product Marketing Manager at Take, to learn how Appcues has helped them improve their funnel metrics, drive conversion, and execute their product-led growth strategy. Take is a Brazil-based conversational platform company that helps businesses across the globe automate their customer communications. They created BLiP, a platform that facilitates the end-to-end creation, management, and evolution of chatbots. BLiP helps companies introduce their brands on leading messaging applications — including Facebook Messenger, WhatsApp, Skype, Telegram, email, and web. Chatbots are becoming increasingly ubiquitous among businesses trying to automate their customer communication and processes. As a product-led company, Take wanted their BLiP platform to be intuitive and easy to adopt, with minimal friction for new users. With this goal in mind, Guilherme started looking at user data to identify bottlenecks in the user journey. Guilherme noticed that while the majority of users created the bot, almost 55% of the users dropped out of the funnel after ‘create the bot’ stage. Also, a further 14% of users dropped out at the final ‘test chatbot’ stage. The overall funnel completion or activation rate for new users was 28.45%. Based on this data, Guilherme realized that to keep users engaged, he had to create personalized walkthroughs So he used Appcues to create a multi-step flow. The flow started with a personalized welcome modal that greeted users and set the right expectations from the onset. 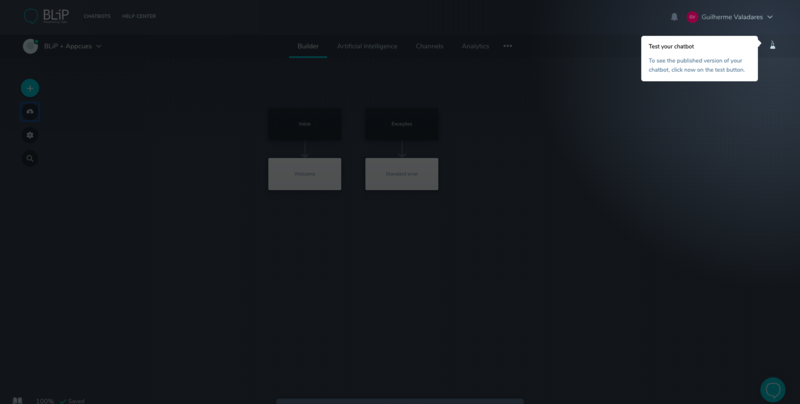 To guide users to the appropriate action, Guilherme created a tooltip to draw attention to the ‘create chatbot’ button, leading users to take the first major step in their journey. After the users completed this step, they were taken to a screen with many possible options. 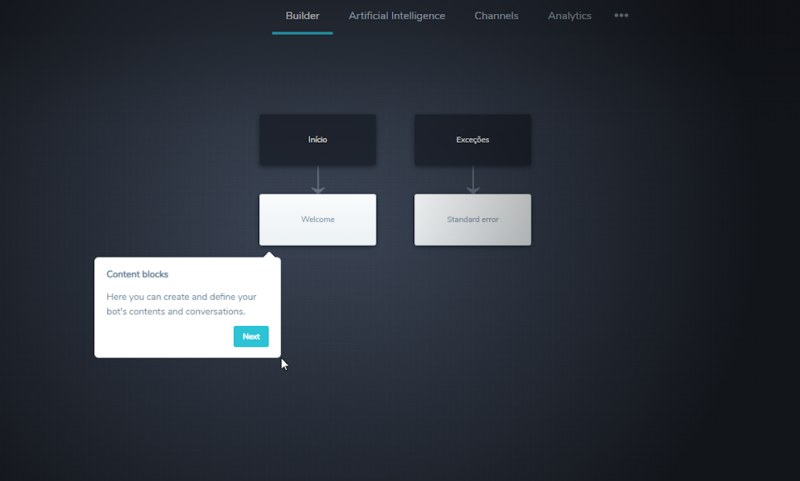 But the most important step at this stage was to create the first conversation flow —so Guilherme added a tooltip to draw users’ attention to the builder where this task could be accomplished. 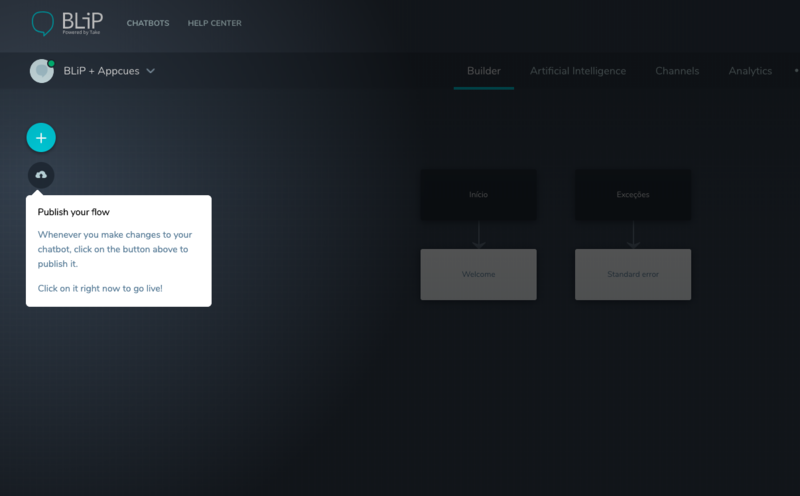 Once the users were in the builder, they needed to understand how to create content and conversations in order to successfully and efficiently complete this step in the funnel. 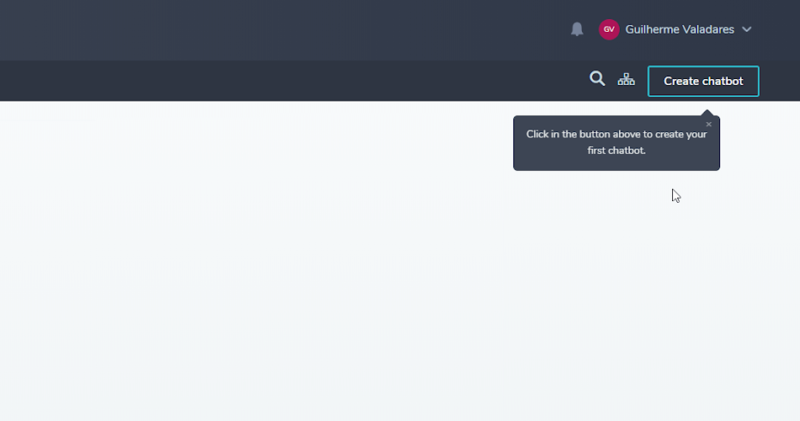 Guilherme added another tooltip that showed users how and where they could add their content. This was followed by a tooltip that asked users to publish the flow every time they made a change to ensure that the changes would be pushed live. 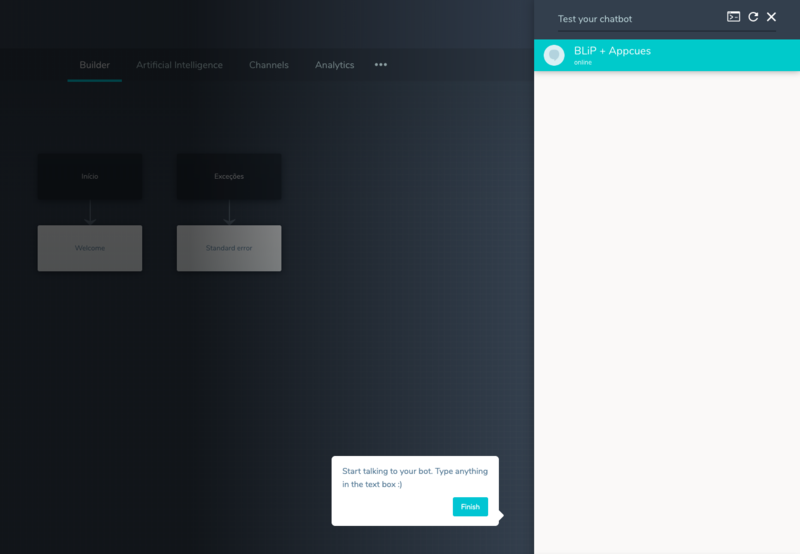 To guide users through the final step in the funnel—testing their bot—Guilherme created another tooltip that highlighted BLiP’s testing feature. 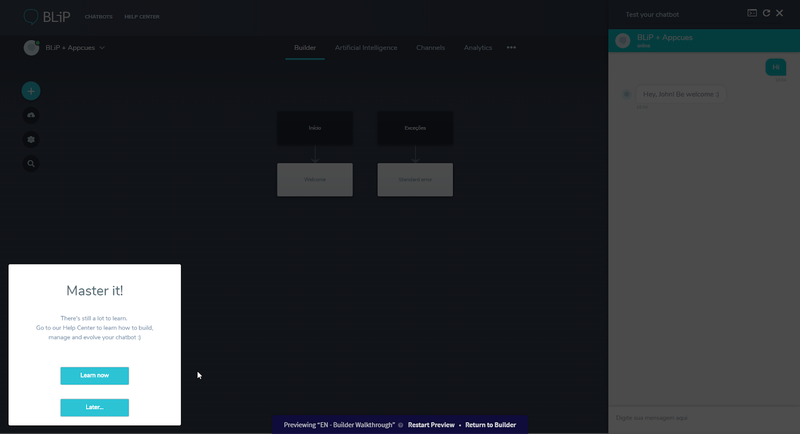 Finally, once the walkthrough was over, Guilherme used a slideout that encourages users to learn more about building, managing, and iterating on their chatbot. Within two months of publishing this Appcues flow, the dropout rate at “publish the bot” stage decreased from 55% to under 11%. Moreover, the dropout rate at the final “test chatbot” stage was reduced to almost 1% from 14%. Overall, the funnel completion rate rose from 28.4% to 63.74%—a 124% increase. User attention spans across the globe are shrinking. Guilherme and his team were aware of this challenge and wanted to provide value to their users, faster. Prior to using Appcues, users spent a median of 1.1 hours completing all the steps in the funnel. After publishing Appcues, the median time to funnel completion was reduced to just 6.8 minutes—a 9.7X reduction in time to value. 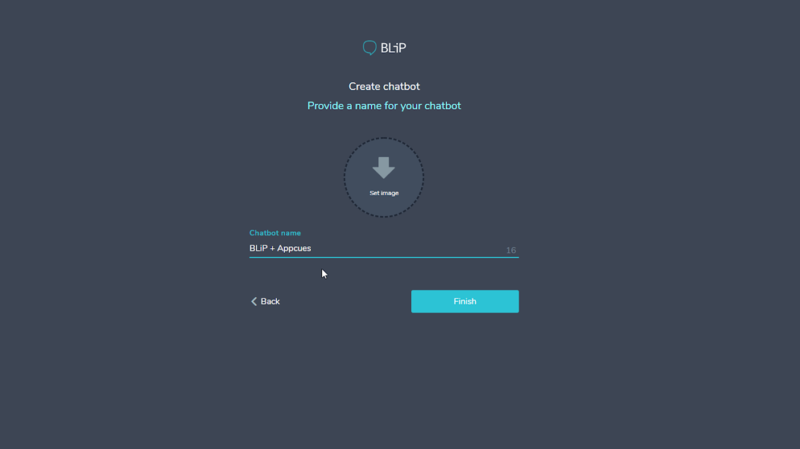 As a comprehensive chatbot management solution, BLiP offers a lot of features and use cases to different teams. Seeing early success with Appcues, Guilherme and his team are now actively using Appcues to run growth experiments throughout their platform. They are building personalized experiences for different personas and use cases, and look forward to the results. Find out more about how Appcues can help improve activation rates and shorten TTV for your own product. Or click here to request a personalized demo.